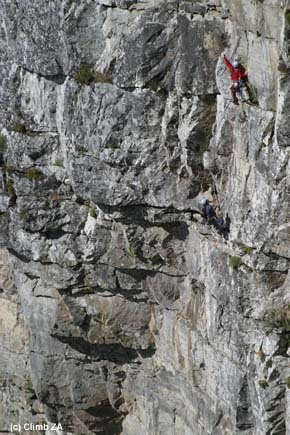 Routes on massive wall above Boschendal?? The huge face situated above the Boschendal Wine Farm, looks blerry fantastic. What's it called, are there any routes on it....and if not, why not? Duiwelskloof is tucked away in that particular set of mountains. You can see the top of it sticking out behind a feature called Devli's Tooth. There are some great country routes in the kloof e.g. Lucifer and Duiwels direct. The climbs are at least 400m high, depending on which route you do. I'm not sure if there are any routes on the walls directly above Boschendal, but they certainly are huge and must have good route potential. No doubt Mike Scott would probably know about any climbing up there. Duiwels is an awesome spot, although I'm not 100% sure what the access situation is. Mr Scott, care to share any knowledge on the Boschendal Massif?? As Jeremy Colenso commented: \"You could never hold a national meet there - because it would fall down if more than 1 party was on the wall!\"
I suggest training on road cuttings before going to climb there. After reading about the Sentinel, Hout Bay, it sounds like just your cup o' tea Guy! Thought there must be something not so kosher about it, since it's so visible yet there's no info to be found about it. Aaah well! Plenty more good rock to go around I s'pose. No its bad Jono, there is a small patch of reddish rock at about two thirds height, = the only good rock on the enitire wall! Some mountains were made just for looking at! It's called Hutchinson's Buttress. Routes like \"Dehydrate\" to the left, and Jerker, Wanker etc. further right. Ya, a bit of loose will scare them all off!! How bad could it actuly be? Grigri wrote: No its bad Jono, there is a small patch of reddish rock at about two thirds height, = the only good rock on the enitire wall! Hawubo! Guess so Greg...and that one coitenly is purdy! While this is certainly not Krakadouw, it's not the worst choss around. Wanker gets repeated every now and then. I know of folk who have done it more than once ! The real problem on these faces is the aspect. They get one HELL of a lot of sun! The routes in Duiwelskloof itself at least keep the shade all morning. What is the worst route/crag in SA? My money is on Fernwood Gully (to the right of the face). According to Tony's thing in the paper - it was first climbed by Travis-Jackson after three days of attempts. 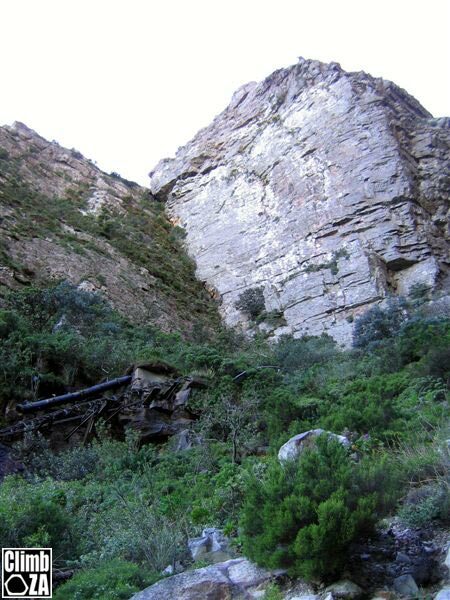 For those not familiar with this route - it is a south facing gully on Table Mountain above Kirstenbosch. It has water running down it all year and it never sees the sun. The rock is really loose and sandy and it's obviously covered in vegetation!! Nice. The top half of the route didnt look that bad... best ask Don or Marijus for a first hand account. I think Guy is refering to the gully to the right of Fernwood precipice itself. Fernwood precipice looks positively inviting by comparison!! My bet would be on any of the routes up Corridor Buttress south face. Definitely the most daunting thing Ive rubbed my nose against, thank god foul weather stopped play. Although Im sure there are several routes in the Drakensburg that would rival these two. Having done various Corridor routes (Echo Wall, Vertigo etc.) on more than one occasion, and knowing that a certain Mr Scott has climbed some of them several times, I reckon the Corridor routes are not the worst. Spring Buttress is similar. Donkerkloof has some rock that certainly puts it into contention. Mike and I have done some interesting stuff on south side of Barrier but it was good enough to lure us back for at least a second look. But, Mr Scott has only done Fernwood GULLY once! For a true perspective on awful rock though one must visit the UK. Although Fernwood Gully is pretty vile and daunting, the award for the grottiest climb must probably go to Woodhead crack, the slanting recess above the old Slangolie pipe Tunnel entrance (the one that has fallen away in recent years). It vies for top honours against a route on Slangolie buttress itself, named Ghastly Gully, which actually is awful but not as bad as Woodhead crack. Aaaaand the winner isss! There you have it! from the horse's mouth so to speak (If anyone knows its Mike, who seems to have climbed everything). Two places not to go this summer! Me Im going to sit on the beach and plan my next trip to Rocklands! Wow - Woodhead Crack must be truly aweful!!! I've nveer climbed Fernwood Gully - but I live directly below it and I often stare at it in awe of the grim determination of people who've actually climbed it (rather than say changing the oil in their car or doing the dishes). Surely there must be some stuff in the Berg that is in a similar league? From what I've read and heard, I'd say about 80 to 90% of the D'berg is in that league. Crumbs!!! Aah, one day I'll stand on top of Devils Tooth *sigh*. The Tyrolean traverse 'descent' sounds radical!!! Who is keen for the obvious (slightly bushy) dihedral in the photo? To find out about the best of the best in rock quality I can suggest a good read by the UK's Mick Fowler, subtitled \"The secret life of a tax collector\". Its very amusing too.